We’ll continue to look into Babylog 8000plus and its advanced use this time. VIVE allows to adjust continuous flow during the expiration phase independently from the inspiration phrase. This is the same function as “Bear Cub 750psv” (described in the 1st lecture) that 2 types of flow can be set separately during the inspiration and expiration phases. The pressure rise during inspiration of pressure controlled ventilators with constant flow is depended on the inspiratory flow. As much as the inspiratory flow is higher, the pressure curve becomes steeper. Higher inspiratory flow makes the inspiratory plateau time longer, on the other hand, we need to pay attention to a lung injury. To set VIVE, press the key “Vent. Option”, select “VIVE” and adjust the expiratory flow with the keys “＋” or “－” (Figure 1-a). 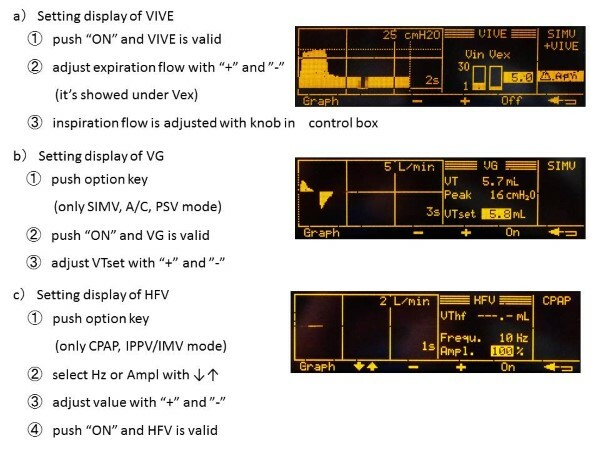 VIVE is available for all ventilation modes except for HFV mode. VG is the multiple ventilation mode which combined benefits of pressure-controlled ventilation, time-cycled ventilation, constant flow ventilation and volume-controlled ventilation. This function is Pressure-controlled ventilation targeting “VT (tidal volume)”. This function is used to prevent the lung injuries (volutrauma or barotrauma) caused by an excessive volume or pressure, it is also used for the automatic weaning. With VG, the unit automatically regulates the inspiration pressure by the mean value of 6-8 breaths in order to achieve a predetermined tidal volume (VTset) (Figure 2). Because VT value of Babylog 8000plus is the expiratory tidal volume (VTe), the ventilation can be maintained by the automatic leak compensation even if there is a serious leak in the tube. However, in case of a serious leak bigger than 40%, the expired VT may be inaccurate. This function can be combined with all triggering ventilation modes (SIMV、A/C、PSV). To start VG, press the key “Option” so that the setting screen will be shown during those ventilation modes (Figure 1-b). HFV of Babylog 8000plus is controlled with the diaphragm and its setting is unique compare to other ventilators. Mean airway pressure (MAP) is automatically regulated to the value set with the PEEP. PEEP matches with MAP during CPAP＋HFV, but MAP is higher than PEEP which becomes the base pressure during CMV＋HFV. There is a setting parameter of the amplitude (Ampl.) with Babylog 8000plus. 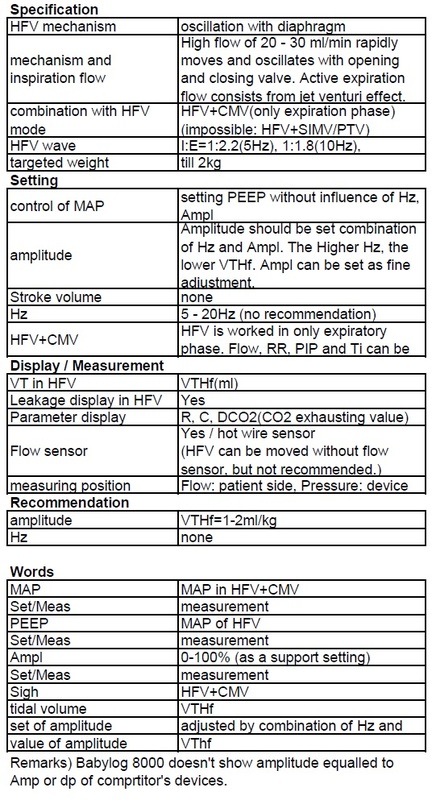 In general, “Ampl.” means “pressure amplitude” with other ventilators, and its unit is in “cmH2O” (SLE series displays as “dp” instead of “Ampl.”). On the other hand, “Ampl.” in Babylog 8000plus is the relative value from 0-100% and it supports the settings. Babylog 8000plus has no parameter for pressure amplitude like other ventilators. Amplitude of HFV is displayed as “VTHf” (Unit: ml) which is measured flow at the patient flow sensor. In general, VTHf around 1.5ml/kg is recommended2). Set amplitude is basically determined by decreasing or increasing the frequency, therefore, there is no recommended value for the frequency. HFV can be applied to patients with BW less than 2kg. HFV is available in CPAP and IPPV/IMV mode. To set HFV, press the “Option” key and the setting screen will be shown (Figure 1-c). A waveform of HFV changes in every oscillations. When the frequency is increased, I:E ratio becomes smaller. For instance, 5Hz makes I:E ratio＝1:2.2, 10Hz makes 1:1.8, and 15Hz makes 1:1.3. HFV may not operate appropriately and it may stop during ventilation when the compliance of breathing circuit is too high (= soft). Even if HFV is still active, higher set pressure is required because Ampl. tends to be weaker. This tendency appears dominantly in disposable circuits. It is desired to use low compliance (=stiff) reusable circuits for HFV mode with Babylog. Because inspiratory gas during HFV mode of Babylog 8000plus is warmed up in the device and warmer inspiratory gas is provided at the end, the humidity function of the humidifier may become impaired. In this case, setting higher temperature for the chamber than usual is required. 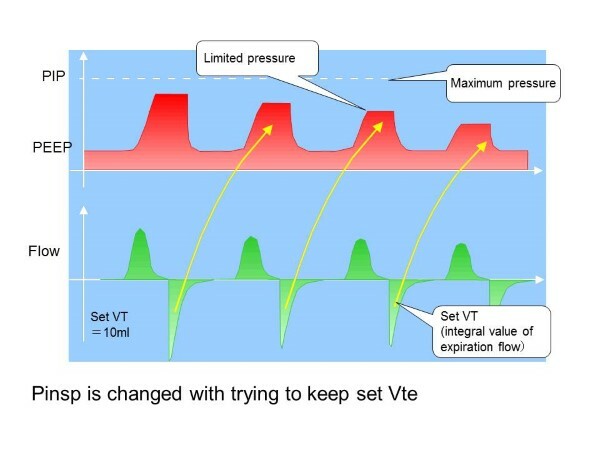 VG adjusts the inspiratory pressure to make the actual VT equal to VT (VTset) with following algorism; 1) When the actual VT is equal to VTset, the pressure stays the same, 2) When VT is not equal to VTset, the pressure is controlled. Also, to avoid hyperinflation of the lungs, the ventilation automatically switches to expiratory when VT reached 130% of VTset. Conversely, VT low alarm occurs when the status of less than 90% of VTset continues longer than set Alarm delay time. To cancel VT low alarm, following procedures should be taken. When the actual pressure value in breathing circuits is equal to set maximum inspiratory pressure, the set inspiratory pressure may be too low. 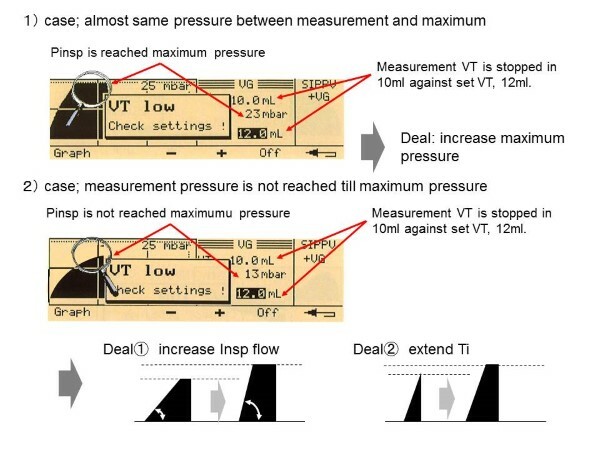 It is necessary to set higher maximum inspiratory pressure to continue VG with the same VTset. Or, if the actual pressure value in breathing circuits has not reached to the set maximum inspiratory pressure, it can be considered that either the maximum inspiratory time is too short or inspiratory flow is too low. In this case, it is required to set longer inspiratory time or higher flow rate (Figure 3). The termination of PSV has higher priority than VG in PSV mode combined with VG. For that reason, the ventilation may shift to expiratory from inspiratory though the set volume is not yet reached. Maximum inspiratory pressure should be set little higher (15-20%) than normal settings. VG ensures the tidal volume as its name suggests. 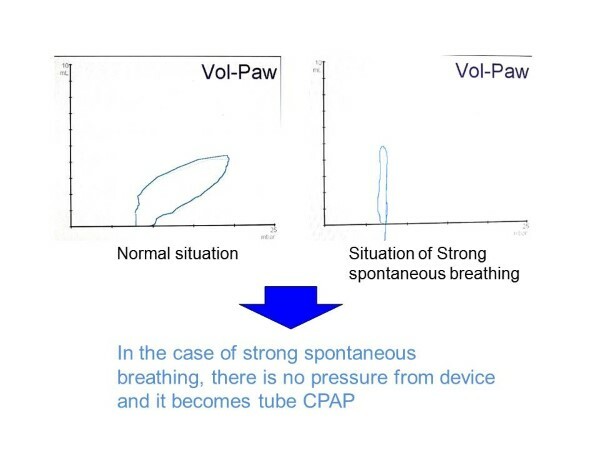 On the other hand, when the patient has enough spontaneous breathing and fulfilled required volume without mandatory supports, it works simply as CPAP mode (Figure 4). In such a case, the VT set is reached for the meantime, but we have to pay attentions to possibility of the collapsed lung in steps. 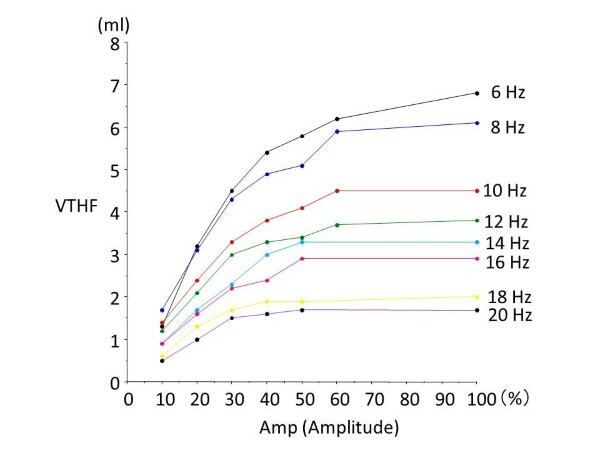 To set HFV, 1) Determine approximate MAP / FiO2, 2)Initial setting of Ampl is set as 100%, 3) Determine approximate Hz to be set according to the patient BW (Set higher values as 12-15Hz for extremely low-birth-weight infants), 4) Adjust Hz to make VTHF around 1.5ml/kg (Hz↓=> VTHF↑, Hz↑=> VTHf↓), 5)In case setting frequency 1Hz lower makes VTHf excessive and 1Hz higher makes VTHf lacking, Ampl. setting is beneficial. After setting frequency 1Hz lower (VTHf excessive), adjust Ampl. lower gradually to reach ideal VTHf. 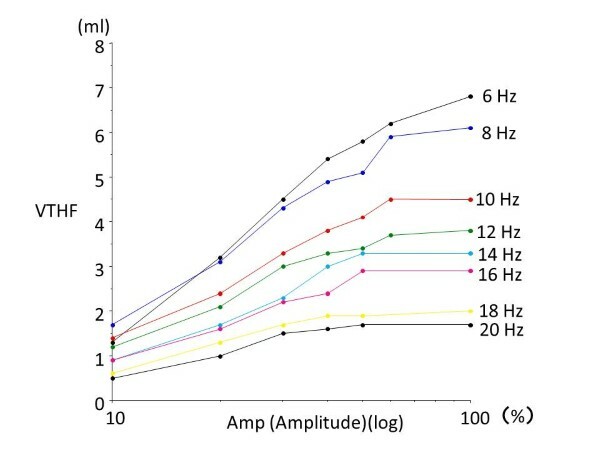 Figure 5 shows VTHf changes according to frequency and Ampl. under certain conditions. Setting less frequency makes larger VTHf, higer frequency makes smaller VTHf. Only integer values are available for frequency and adjust the gap with Ampl.. Change in VTHf is moderate by adjusting Ampl. from 100% to 60%, and drastically dropped after that until 10%. If we define Ampl. horizontal axis at the logarithm, it gets closer to the straight line than before. Therefore, the setting of Ampl.step by step (100% => 50%: 1/2 of the previous value =>33%: 1/3 of the previous value…) easily reaches appropriate VTHf (Figure 6).